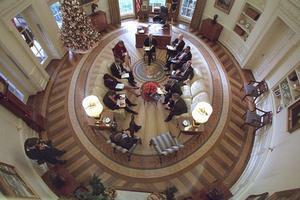 1 Caption: President George W. Bush meeting with his advisers in the Oval Office. 2 Does this sound a little bit like your daily routine? You start out with choosing something to wear - maybe a favorite T-shirt and a pair of jeans. Next you pour out a bowl of cereal for a quick breakfast before you run to catch the bus. 3 In school you do your assignments in class and navigate crowded hallways to get to the next class on time. After your classes are done, it's back on the bus with the other kids from your neighborhood for the ride home. 4 Maybe you play outside for a while or maybe you do homework first when you get home. Then it's dinner time -a meal cooked at home by Mom or maybe burgers and fries at McDonalds. If the phone rings, you check to see if it's a friend calling. A few video games or a favorite TV show finish off the day.